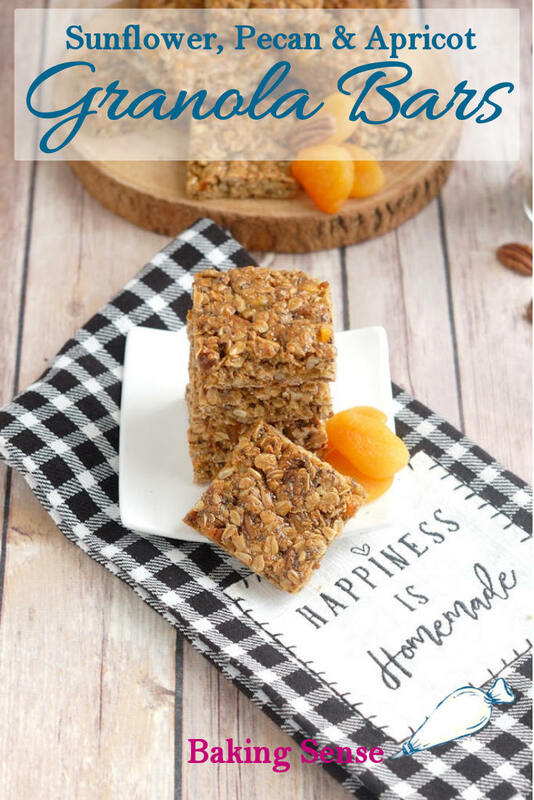 Homemade Sunflower, Pecan & Apricot Granola bars are a nutritious and delicious treat that you can enjoy for breakfast or as a snack. 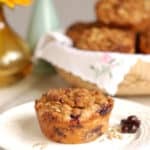 This recipe is abundant with healthy ingredients like sunflower seeds, sunflower butter, pecans, oats and protein-rich egg whites. You can feel great about making these any time the mood strikes. Well, it’s that time of year when we’re all trying to make up for our holiday indulgences. I know I am. 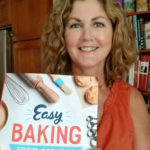 So, what’s a gal to do when she’s got a hankering to bake (or it’s her job), but she’s trying to keep things healthy? 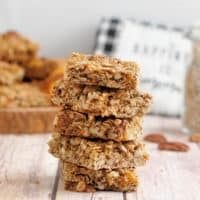 Bake Granola Bars, of course. 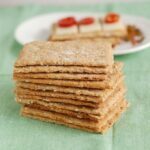 The basis for this recipe was the Granola Bar recipe in my book, Easy Baking From Scratch. I love that recipe and wanted to play with some new flavors. 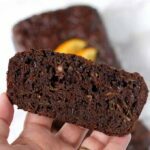 With the goal of making a great post-workout or breakfast treat in mind, I decided to lighten up the fat and sugar in the recipe. While I was at it, I amped up the healthy ingredient quotient with sunflower seeds, sunflower butter, chia seeds and flax seed meal. But don’t worry, they taste really great, honestly! 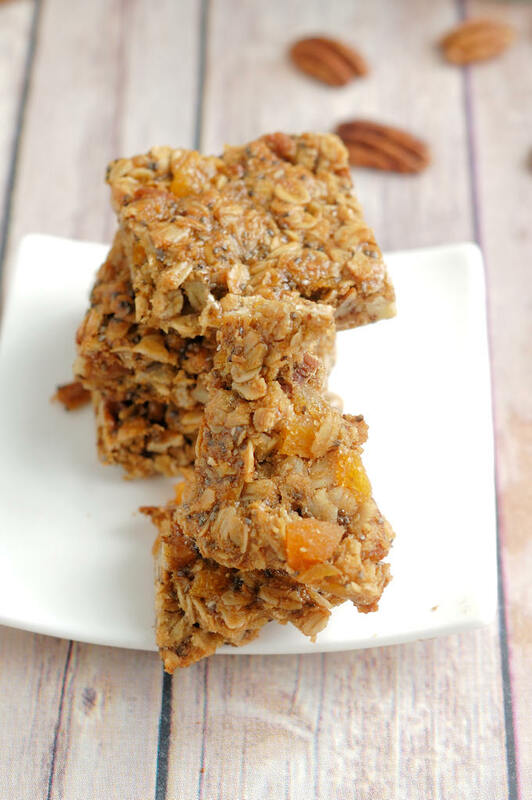 I think you’ll really like these lower-fat, lower-sugar Sunflower, Pecan & Apricot Granola Bars. 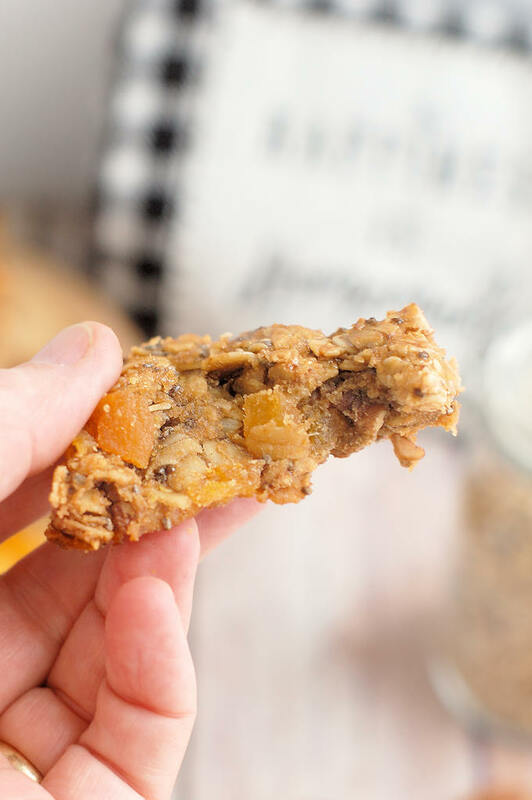 I love the balance between the savory sunflower butter and the sweet bursts of dried apricots. I hope you do to. You don’t need to line the pan with parchment paper, but it makes it easier to lift the baked bars out of the pan. 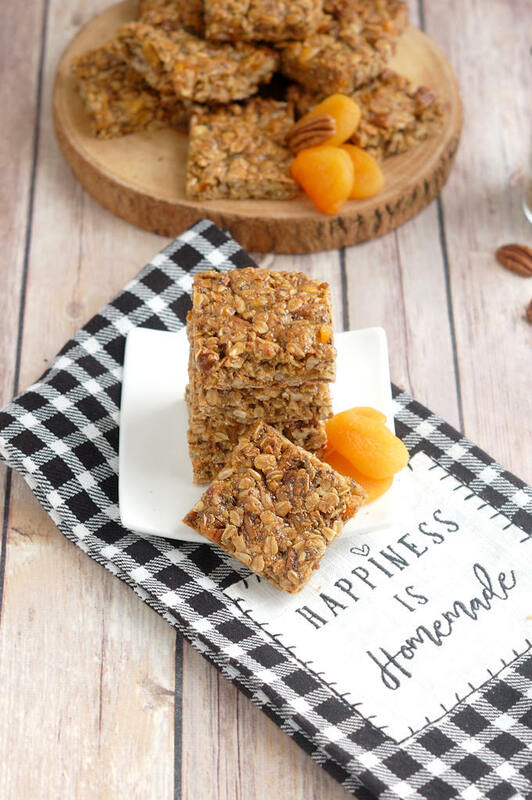 You can use up to a 1/2 cup of the brown sugar and/or honey if you’d like a slightly sweeter granola bar. More honey will make the bars a little softer and moister. In place of the pecans you can swap in roasted peanuts, coarsely chopped almonds or hazelnuts or a mixture of nuts. 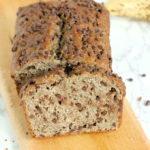 Wheat germ or coconut flour can be used in place of the flax seed meal. The sunflower butter can be replaced with almond butter, peanut butter or any nut butter of your choice. 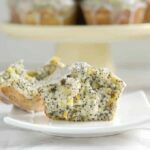 You can use any seeds in place of the sunflower and chia seeds. Any dried fruit can be used in place of the apricots. 1. Preheat the oven to 350°F. 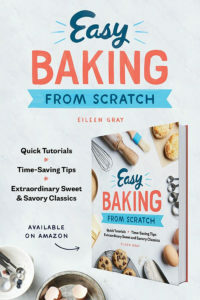 Brush a 13”x 9” baking pan with a thin coating of vegetable oil and line the pan with parchment paper. The parchment lining is optional but does make it easier to lift the bars out of the pan. 2 In a large bowl, combine the pecans, sunflower seeds, chia seeds, flax meal, cinnamon, ginger, salt, oats, and chopped apricots. 3. In a small saucepan, combine the oil, sunflower butter, brown sugar, and honey. Cook over medium heat until the mixture melts and begins to boil. Pour the oil mixture over the oat mixture and stir to combine. 4. Whisk the egg whites until they are frothy then fold them into the granola. Toss the mixture and break up any clumps. Pour the granola into the prepared pan and firmly press into an even layer. 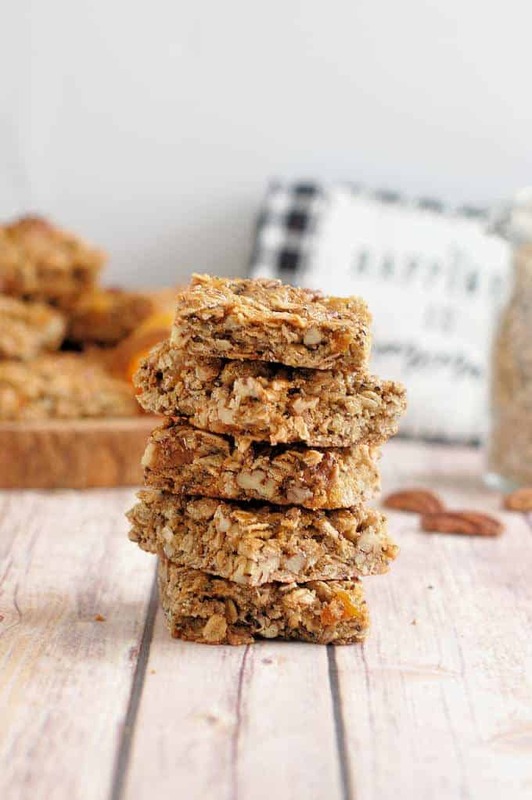 Moisten your hands with a little water to prevent them from sticking as you press on the granola. 5. Bake until golden brown around the edges and set in the middle, about 20 minutes. Cool in the pan for 10 minutes, then use the parchment paper to lift the bars onto a cutting board (or flip the pan if you didn't use parchment). Cut into 24 portions and cool completely. The bars keep in an air tight container for up to a week. 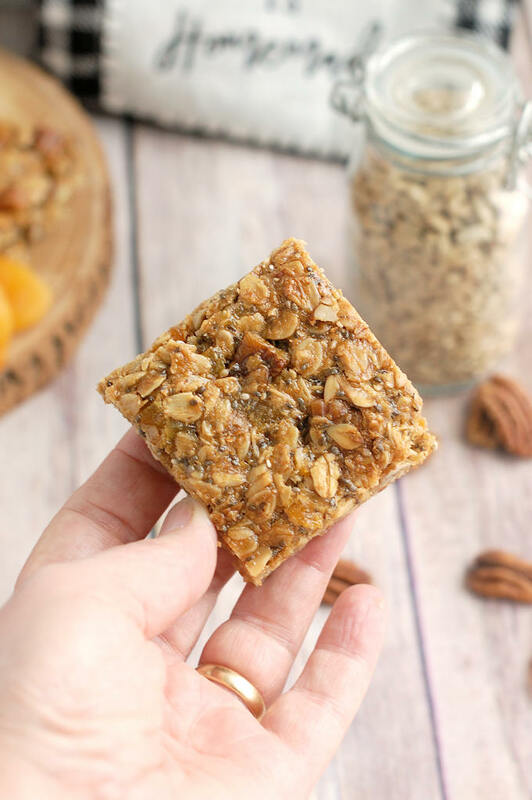 You can use up to a 1/2 cup of the brown sugar and/or honey if you'd like a slightly sweeter granola bar. This is an endlessly adaptable recipe. Try swapping out the pecans for almonds or peanuts. 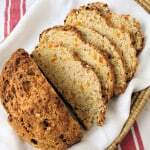 You can use any nut butter in place of the sunflower butter, any dried fruit to replace the apricots, and any mix of seeds that you like.